Amongst the Egyptologists believed that the introduction to power of electricity of it kind were used during the ancient Egyptian as the symbolized carving appear at the secret chamber of underground passage of Dandera temple, and on the wall of the temple of Isis. Some scholars mentioned that they also use mercury to create this huge energy. I am not an Egyptologist nor I am an Egyptian. From my own perspective of view that I believe, energy sources are everywhere that can tape in anytime. Energy is a mind-set, feeling, focus to one thing that creates energy to power any mean. By using an ancient technic of opening body points we can harvest huge amount of cosmic energy, store it and use any time we need. Positive side: created light effect, building temples, lifted heavy materials, source of food, medication, agricultures, prosperity, light up places, etc. Negative side: black magic, love attractions, poison, look beautiful or handsome, catching genies, etc. For mixed purposes: power for the kings, queens and nobles, attacking enemies, to win the wars, move from one place to another, etc. The priest: priests holding very large power in ancient Egyptian. Priest was head of the army, a prophet, a head of religion, head of mummification, etc. 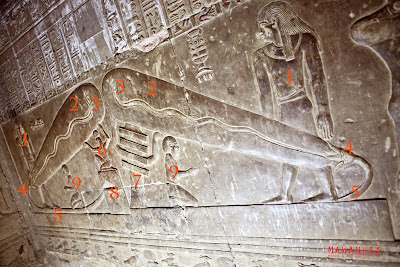 Symbolizing here that the priest holding huge light bulb to direct Egypt toward brighter future. Moving snake symbol of electric discharge or life has to be continuing, move on with activity and life will goes on and meaningful as bright as the light bulb. Flower pods or lamp sockets to symbol relation between life and death is just a connection of cable as the socket of the life also goes to it own journey. Flower stem or cable is to symbol of sacrifices fir the brighter future. If we want to have brighter future we have to work extra hard to carry the current flows with many dangerous zone and has to be connected to other end or otherwise the energy itself will destroy the life itself. Appeared the God of Air and Light or symbolized as the wind and the atmosphere of the planet earth. The God symbol to illuminate the darkness and marked the timing between daylight and nighttime. To also separate between earth and heaven, life and after life. The God symbolized space in the universe, between earth and other stars and planets. The Djed pillar is a symbol of stability and durability. It got it name from the area in area called Djedu in Lower Egypt that where were the pillar believe used as one of the sacred object of worship. This beautiful stylist character was a symbol that resembles a column with large base and capital with four parallel bars with very strong character and charisma. To store energy or energy storage is the main source of energy that collected from cosmic of universe. This is can be something like inner-self energy that can be released anytime they want. Or maybe mercury that be used for spiritual purposes to/or create that large power to generate the large bulb imagination. Or something else! The Dandera light show is might be true happening and involved vey large energy source. Until this time is still a wonder since there was no proves that support this theory scientifically. totally wrong concept.. no professional historian/ archaeologist agrees with this... this is dipiction of mythical story of creation of world..The view of Egyptologists is that the relief is a mythological depiction of a djed pillar and a lotus flower, spawning a snake within, representing aspects of Egyptian mythology.The Djed pillar is a symbol of stability which is also interpreted as the backbone of the god Osiris. In the carvings the four horizontal lines forming the capital of the djed are supplemented by human arms stretching out, as if the djed were a backbone. The arms hold up the snake within the lotus flower. 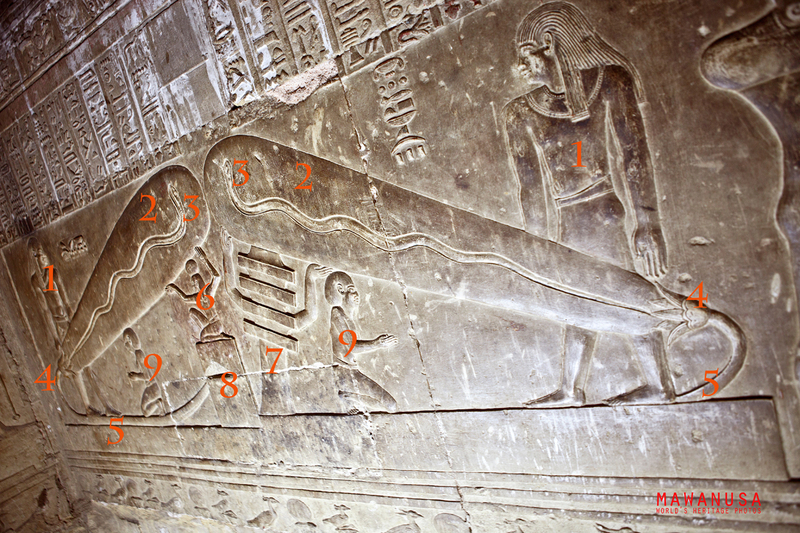 The snakes coming from the lotus symbolize fertility, linked to the annual Nile flood.